First Samuel 27:6 refers to the divided monarchy, when the 10 tribes of Israel rebelled against the two tribes of Judah, which occurred after Solomon’s reign. From this we can conclude that the book came together sometime after the death of David (971 BC) and perhaps even after the death of Solomon (931 BC). Because the book contains no reference to the Assyrian invasion in 722 BC, it likely originated before the period of the exile. Kingship: As the divine King, God designated a human vice-regent, David, to rule over His people. This history validates David’s house as the legitimate rulers of Israel. It also fulfils Jacob’s promise that the sceptre will never depart from Judah, David’s tribe (Genesis 49:10). God is still sovereign in the 21st century. He will accomplish His purposes with or without our cooperation. But as was true in the lives of Samuel, Saul, and David, our response to God’s call affects our outcome. Will we obey Him as Samuel and David did and live lives marked by blessing? Or will we, like Saul, try to live on our own terms? “To obey is better than sacrifice,” Samuel told Saul (1 Samuel 15:22). That truth still speaks to us today. 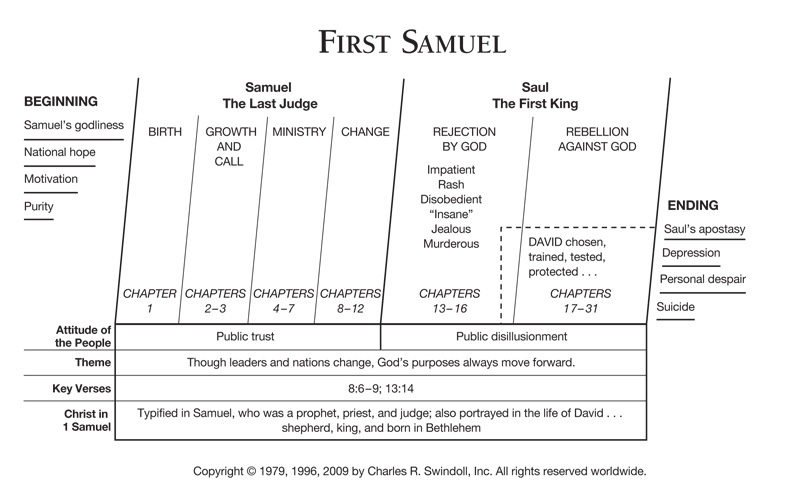 Find resources in the book of First Samuel in our resource library.